Many readers will remember the story of the priest in Revolutionary France, who, vested as for Mass, said the praeparatio while ascending the steps to the guillotine. Introibo ad altare Dei, ad Deum qui laetificat iuventutem meam. As the erudite Dr Simon Cotton reminded me the other day, his name was Noel Pinot; having refused to take the oath whereby he would have submitted to the State, he was arrested while secretly saying Mass in a remote farmhouse in the Vendee during the February of 1794, and executed not long afterwards. I find it a haunting story. So often, as I stand at the foot of Mount Moriah and in my unworthiness prepare to go up the Temple Mount to offer to the Father the Tamid Lamb for His whole people, the image of Blessed Noel Pinot climbing that ladder comes back to me. And here is a certainty, for me as for every single priest in the world: there will be a day, one particular day and not another, when by God's grace I offer that Sacrifice, that Mystery, a Beauty so ancient and yet so new, for my last time in via. 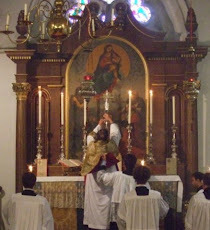 If you are celebrating today the Feast or the Octave Sunday or the External Solemnity of Corpus Christi, of your charity pray for all of us who have this awe-full responsibility, and also for so many young men who this month will be ordained to the Sacred Priesthood, to be sons of our Father Aaron. May the Ancient of Days make His merciful Face to shine upon all His cohanim. And thank you, Father H.
May the Lord God remember your priesthood in His kingdom. I offer my prayers for you and for all priests.